As James Connolly was uttering these words for the first time in 1897 no doubt he ever imagined how relevant they would still be to political events unfolding in Greece and Ireland in the 21st century. Connolly’s assertion being to truly break the connection with capitalism to declare national sovereignty an occupied nation must articulate an alternative socialist model, create institutions to implement that alternative and convince people it’s in their own class interest to establish the collective society. Greece and Ireland have foreign capitalists, landlords, financiers and an entire array of commercial and individualist institutions sucking profit out of its economy for the enrichment of the already rich. If there is to be revolution in Connolly’s sense revolution must recognise the tipping point, seize the moment, act decisively or risk losing the opportunity for another generation. After marching his troops to the top of the hill it looks like Alexis Tsipras is just about to march them back down again, tail between their legs. As Tsipras lobbies to get SYRIZA to back an austerity package, nearly identical to the one 61% of the Greek people voted against in the referendum, the reality that there is no parliamentary road to socialism, anywhere, has never been more clear. The message from the top of the neo-liberal European dictatorship is their facade of democracy, even in the eyes of the world, matters nothing if it’s not in the interests of the EU/ECB financial elite. Democracy is only democracy when the EU gets the result it wants. The redistribution of wealth to the top 1%, all over Europe, must continue at all cost, and as we know in Ireland it’s a heavy cost. Ireland is no stranger to humiliation at the hands of the same European institutions currently making the Greek people crawl on their hands and knees in sackcloth’s and ashes all the way to Brussels for daring to act in their own national interests. The Lisbon Treaty referendums, successive austerity budgets, slashing public services, bailing out the banks and creating mass unemployment was all dictated from Brussels. 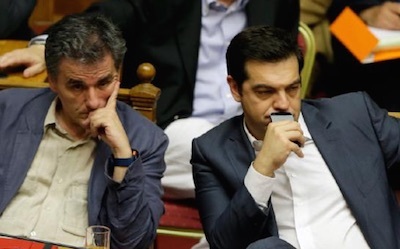 On the face of it the KKEs scepticism and mistrust has been vindicated SYRIZAs reformism has cost the Greek people a valuable opportunity to start again with a blank slate. None of the lessons learned from the Lisbon Treaty referendums or years of imposed austerity here have been taken on board, SYRIZA can be accused of class collaboration of implementing the will of the EU elite against the interests of our class and their nation. The lesson from Greece that the Republican Left, and indeed the wider working class movement, in Ireland need to learn is there can be no compromise on matters of principle. The institutions of capitalism are going to act in their own interests at every opportunity on their principle of profit before all else, even lives, as they have always done. It must be the task of the IRSP and all others on the Irish left to articulate our alternative, build alliances with each other and act in the interests of our class not our respective political party. It’s only by this honest engagement can we hope to build a socialist movement on this island capable of implementing our vision.